Due to some unforseen circumstances, I have decided to put McKinley up for sale. 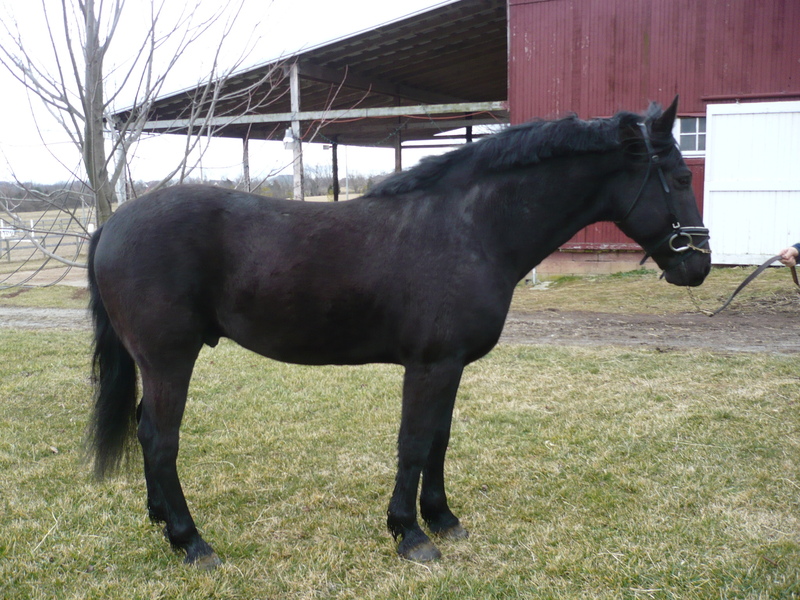 If anyone is interested in a nice 5 year old TB gelding, please check out his ad on dreamhorse.com or on my website under “horses for sale”. He is a nice mover with the potential to do well in the dressage ring, hunter ring, and the eventing world. He is priced to sell, but price will increase with training. Asking $5,000. Please contact Joy at (937) 623-8337 . 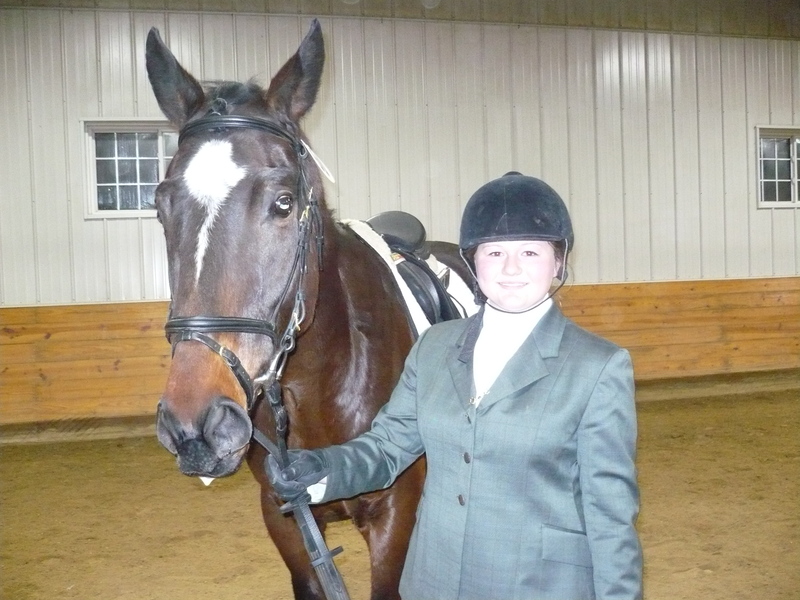 One of longtime boarders and riding students, Julie Hooper, found out Monday that she was accepted into the vet program at the University of Illinois. Illinois was one of her top two choices, so we were thrilled to hear that she was accepted! This means she will be leaving us in August to start her four year veterinary medicine program. We are going to be extremely sad to see her go, but we are really excited for her to start her new education. She will be greatly missed. Congratulations, Julie!!! Today, during the 60 mile an hour windstorm, Sullivan got a grooming. His mane was cut (not enough time for a real pulling job yet), whiskers clipped, tail trimmed and banged, and his body de-mudded. 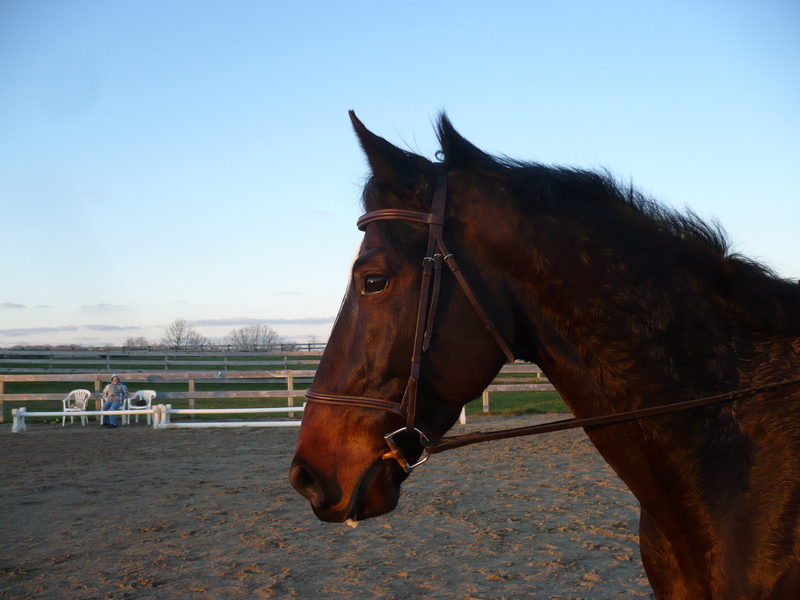 We fit his new bridle to him, switched his bit, and took some pictures. Not the greatest day for pictures, but you’ll get the idea. Overall, he was a very good boy. 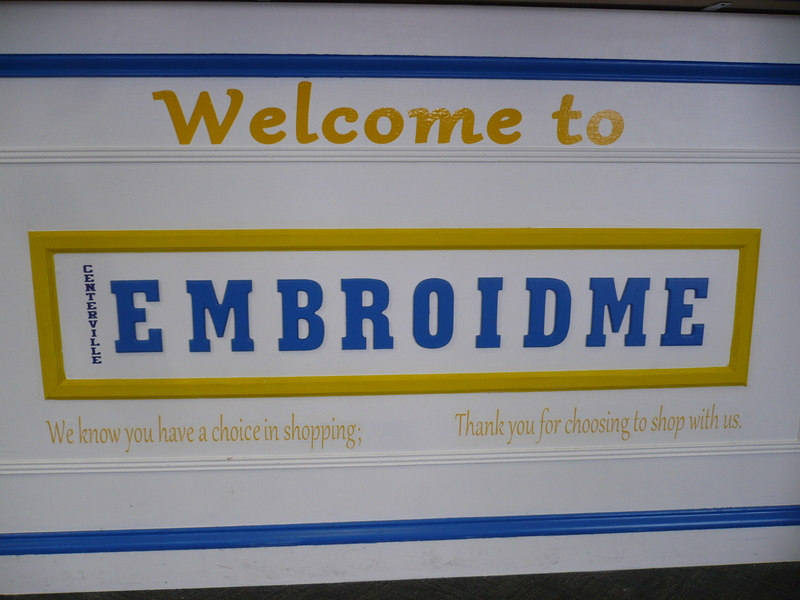 WETHERBROOKE FARM LOGO ON SALE AT EMBROIDME!!!! For the entire month of March, the Centerville EMBROIDME will be offering a “BUY ONE GET ONE FREE” sale on the Wetherbrooke Farm logo. Bring in your saddle pads, polos, backpacks, tote bags, saddle covers, bridle bags, fold up chairs, and anything else you would like to have embroidered with our farm logo. The store is located less than one block east of Centerville High School. Flyers will be located in the tack room soon. Start gathering up your stuff! Today we brought home a new lesson horse. Sullivan (“Sully” for short) hopped into the trailer with just a bit of coaxing, and moments later we were heading back to the farm. He wasn’t quite as eager to back out of the trailer, but with a little effort we were able to talk him into it! 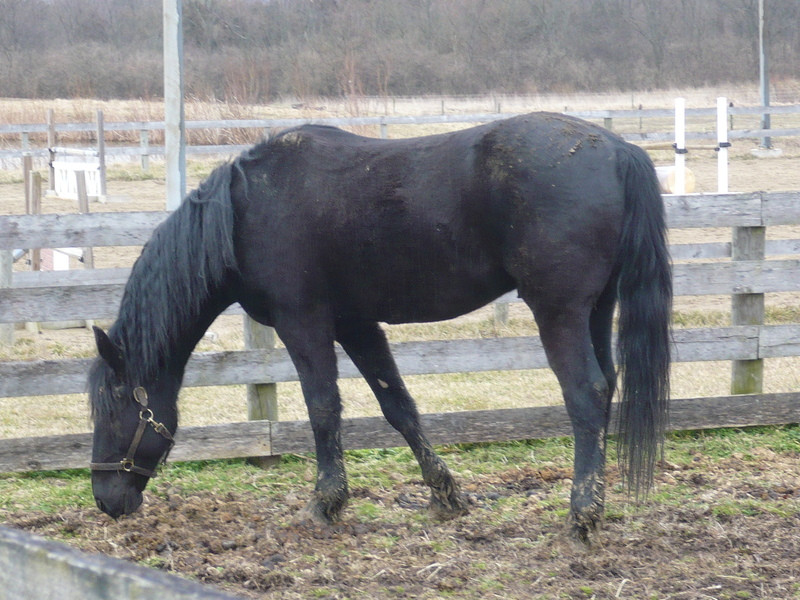 Sully spent some time out in a paddock before settling in to his new stall. We look forward to spending a few hours tomorrow getting his mane pulled, his tail trimmed, his whiskers clipped! Keep posted for the “after” shots. We are currently offering a few more lesson spots in our evening program. 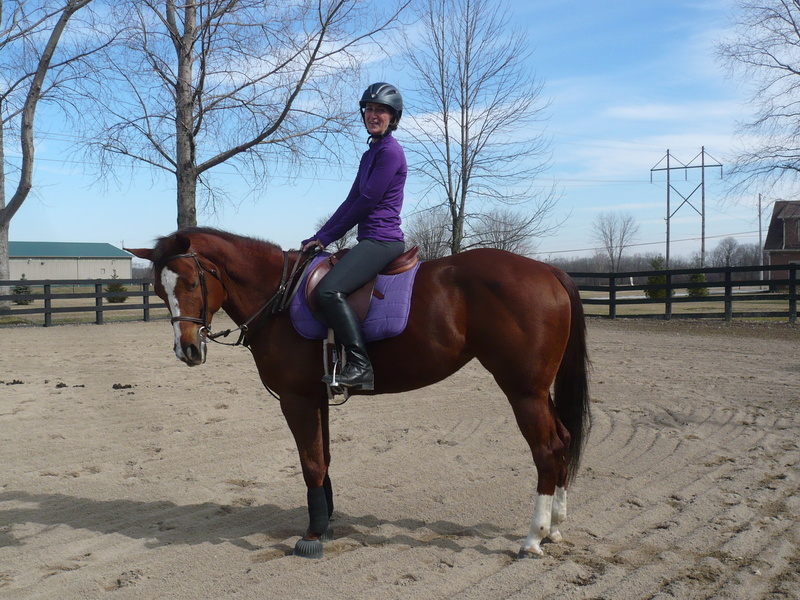 If you or someone you know is interested in taking beginner-advanced riding lessons, please contact Joy at (937) 623-8337 OR email us at Joy@wetherbrookefarm.com. The new lesson horse comes tomorrow! 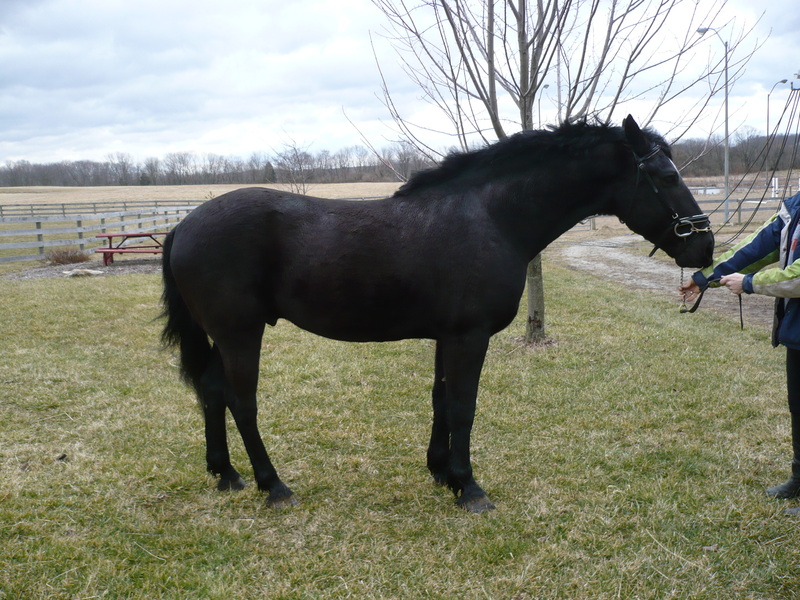 Tomorrow we are headed over to a nearby farm to pick up our new lesson horse. 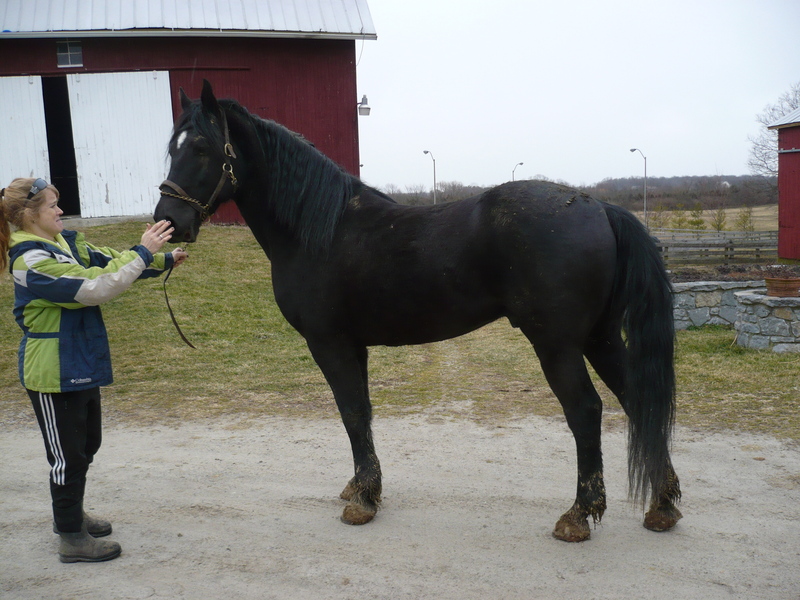 He is a 6 year old, 16.2 hand, percheron cross that looks a lot like Aragon. 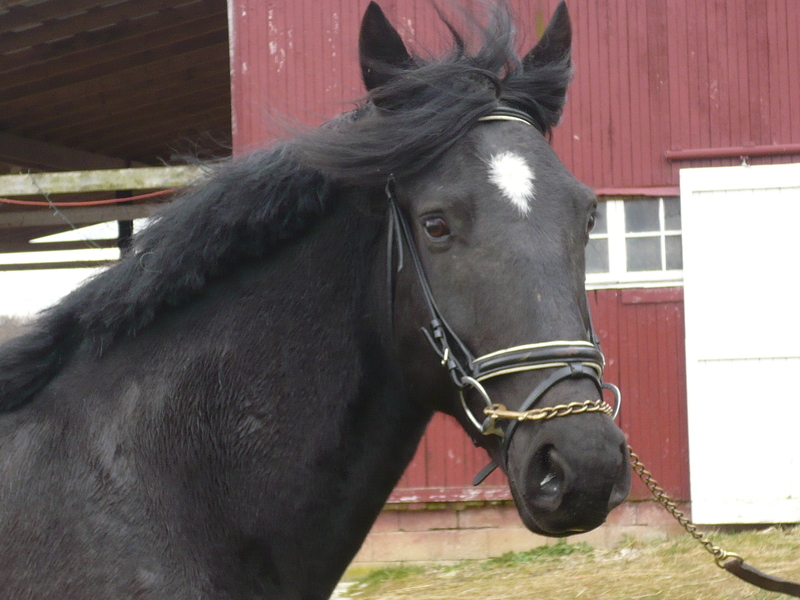 We are really excited to be able to add another horse to our lesson program and show team! Pictures of the new guy are coming soon. On Wednesdays I teach at a farm down the road. I have two students there who have been working really hard to reach their riding goals on two horses at opposite ends of the energy spectrum…. Jackie and Giselle are making huge strides! 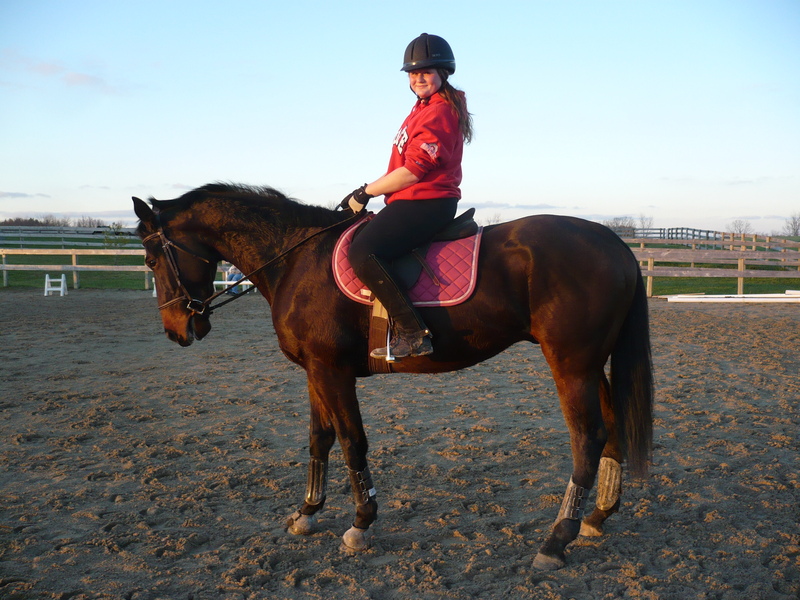 I am really pleased to see how far she and her horse have come since starting lessons with me this past fall. Nothing is better than seeing Jackie smile from ear to ear while she and Giselle “zoom” around the arena! Keep up the good work, Jackie! Jodi and Socks have been with me for a little while longer. Socks and Jodi had a lot of energy related issues to work on and have made fantastic improvements. They are now doing training level dressage movements and jumping small courses of up to 2′. Great job, Jodi! 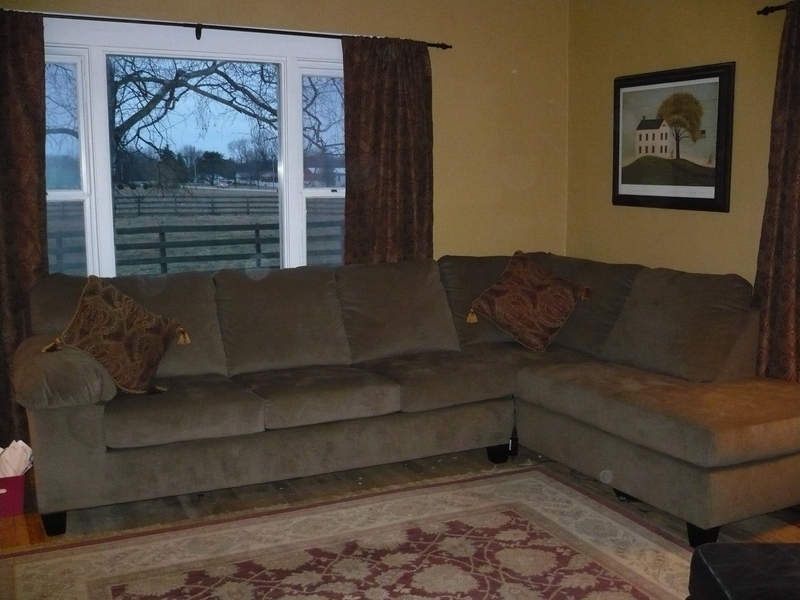 Though we were really excited to sell our big green couch, it was a bittersweet moment. The kids were sad to see it go. We have had that couch since before Kate was born. It has served us well in the 3 houses we have lived in since we bought it, and it had become a part of the family. Kate and Wade took naps on that couch, watched their first veggie tales on that couch, and used it as a jungle gym for their whole lives. 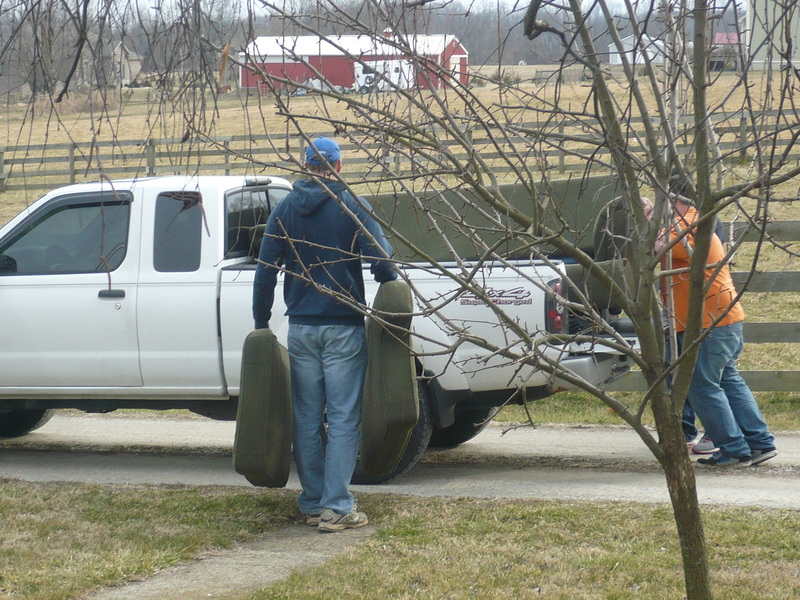 Two guys and a truck picked it up on Sunday, and we said goodbye to big green. I hope they enjoy it as much as we did. Today I started Gus back over fences. Wow…….I was having flashbacks to being in Florida with Dorothy. We went right back to walking crossrails and torture circling our way around the arena. He was just plain obnoxious and wild. I had moments where I wondered just how I managed to stay on him. The good news is that while he was being bad his hocks felt fantastic! 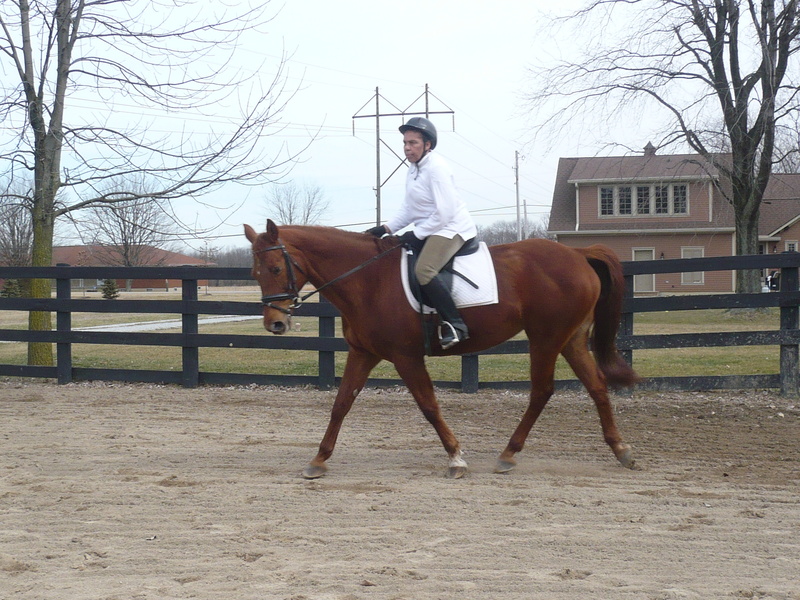 His trot felt amazing, and his canter was noticeably better. I figure that he deserves the chance to be rotten after feeling stiff or sore for the last few months. It seems like the injections are off to a good start. Now I just need to get his jumping brain back. You know it’s a bad jumping day when you can’t wait to get off of Gus and get on Rhyland for a jump school. While Gus was an absolute maniac today, Rhyland was great once again. What is up with that??!!! I think he has truly decided that he wants to stay here and be an upper level eventer. His canter was rideable, he came back to me upon landing, and his form felt great. We did some solid Novice level jumping today, and I’m about ready to raise the fences to training level. Mckinley is also progressing well. Emily has been working on the dressage and some low fences. He is starting to be solid enough in the flatwork to be able to raise the fences a bit. My goal for him is to be able to do Greater Dayton in May. If all goes well with his x-c schoolings, he will be ready for starter by then.